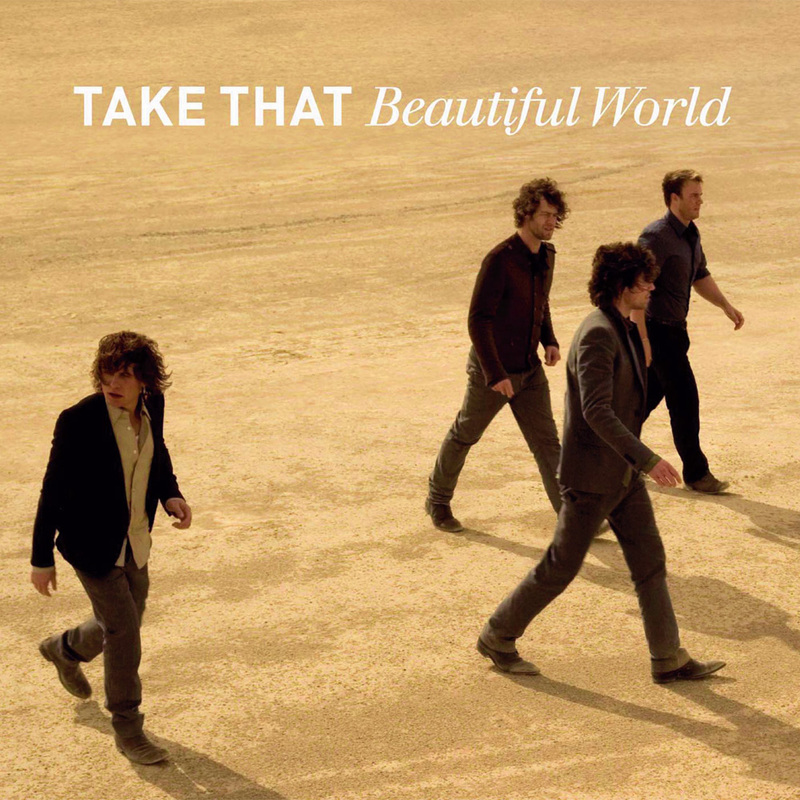 Today’s POP RESCUE from a loveless future, is the 2006 comeback album Beautiful World for the four-piece group Take That. This 12 track album opens with fourth single Reach Out, which begins with piano, gentle strumming guitars and a light beat. Gary Barlow‘s softer vocals are rich here, and in the verses he manages to keep the vocals quite low pitched. He’s joined by the rest of the group for the chorus, where the song brings in some heavier guitars, but the song manages to retain it’s fairly light sound. This is a gentle start to their album, and doesn’t aim for an awkward mis-fire for the opening of the comeback album. Next up is lead single Patience, again beginning with acoustic guitar and Gary’s vocals. He’s joined here by piano and strings, and the song builds perfectly to a powerful chorus where the rest of the group give some wonderful vocal harmonies. This song is flawless, and for a comeback single, this is perfect – a nod to the years their fans have waited, and a big, strong, song to belt them back into action. The album’s title track Beautiful World follows and this song sees Howard Donald take lead vocals. It feels slightly odd to hear Howard and think that it is a Take That song. This song has a great warm feeling with a rush of guitars, bass and beats. Howard’s vocals follow the same kind of vocal style of Gary, but at a slightly different pitch. There’s also a pseudo-William Orbit sound on synths in the background. This is followed by Hold On, which sees Mark Owen take the lead. As with the previous songs, we’re treated to acoustic guitar, piano and strings. Mark’s familiar vocals sound effortless, as he makes his way through an almost dreamy verse and first chorus. Bass and stronger drums arrive to lead him into verse two. This feels like a mature version of his 1996 solo single Child. Like I Never Loved You At All sees Gary return to the mic, and this song feels musically like a bored Coldplay meets something Leona Lewis might have wailed over. The song gently plods along, giving Gary an equal showcase for his vocals and piano playing amid a wash of strings. It’s a nice enough song, but if it went missing, I probably wouldn’t go looking for it. Big hit and second single is Shine, again led by Mark, this is a catchy little Beatle-esque number, that quite rightly took the charts by storm, and gave a somewhat epic video. The bouncing melody, mixed with Mark’s vocals and the vocal harmonies really sets this song aside on this album so far. A masterpiece. Third single I’d Wait For Life is a slow piano ballad, giving Gary another track. Initially this sounds like something that you’d expect from a George Michael album. This song is all about Gary, his voice, and piano. In a lazy Elton John way, after about 3m 25s you finally get a beat… but only briefly and in a dramatic X Factor-winner-song kind of way. Can’t believe that this was a single, and I don’t think i was alone – with it being the first Take That single since 1992’s I Found Heaven to miss the top ten, and it had dropped out of the top 40 by the second week. Ain’t No Sense In Love follows and this is a mid-tempo piano, strings and Gary-led track, and to be honest, it’s a little formulaic musically with several of the others on this album so far, and is dangerously edging towards a Michelle McManus album track. This is followed by What You Believe In, which opens with some nice warm vocal harmonies, before bringing in some acoustic guitar. Mark has the vocals here, and his vocals sound perfectly fragile and almost David Bowie-ish. The guitars and beat give a downbeat reminiscent and song of regret. The chorus again reeks of another missing late-Beatles song we’ll never know. This is quite a nice little sad song. Howard has lead on The Mancunian Way, and this song has a lot of great nods to where the group have come from, and Howard’s vocals give it a lower pitched, rawer feel. Musically, it plugs straight into some late-Beatles sound again. Cuteness points go to the ending – getting some kid to sing at the end. In a rare turn Jason Orange gets lead vocals on this almost country/folk track Wooden Boat, thus proving that he’s not just the dancer. I think that this should probably have been the single instead of the dreary Gary-fest that was I’d Wait For Life. This song is delicate, intricate, and the lyrics are beautiful. Jason’s vocals make light work of this, even though he sounds like he’s living the sad narrative. Perfect. Then, tucked at the end of this long track, is ‘bonus’ track Butterfly. Gary takes lead here, and he’s once again joined by acoustic guitars and strings. This song manages some lovely harmonies between Gary and the rest of the group. The song remains light, and builds perfectly, giving Gary plenty of space during his ‘just fly away……‘ vocals, as if it’s just him and it. Over all, this is the perfect comeback album – no awkward or risky near miss sound. Instead, it plops for well crafted, slickly produced songs. It’s musical reminiscence back to late-Beatles would have certainly helped them to reach an older audience demographic, not just those (now older) fans who had grown up with their 90s pop. The album has become (as of 2014) the 32nd biggest selling album in British music history. It certainly has some wonderful tracks on it, but at times we’re a bit over-Gary-ed with the dreary X Factor-winner style sludgy ballads that somewhat blighted the music charts during this period of music. Where are Take That now? After the success of this album and it’s associated tour, a tour edition was released, which contained the album’s final fantastic single Rule The World, taken from film Stardust (2007). By the end of 2008 they had released the follow-up album The Circus, which would go on to signal their return was for the long-term. Former-Take That member Robbie Williams returned for their album Progress (2010), and it also marked the final appearance of Jason Orange. Take That have continued with sell-out tours, supporting their most recent album III, which sees the group as a trio for the first time. 2006 UK CHART POSITION: #1, certified 9x Platinum. Posted in 2000s, Mark Owen, Robbie Williams, Take ThatTagged 2006, album, Beautiful World, comeback, Gary Barlow, Howard Donald, I'd Wait For Life, Jason Orange, Mark Owen, Patience, Reach Out, review, ShineBookmark the permalink.